Former Republican presidential candidate John McCain will announce Wednesday the formation of the Country First PAC. WASHINGTON (CNN) –- Arizona Senator John McCain is adopting a major 2008 campaign slogan for a new political action committee designed to support not only his own planned re-election run in two years, but help him put his stamp on the rebuilding of the Republican Party. The formation of the “Country First” PAC is to be announced Wednesday, two sources familiar with the plans tell CNN. One of the sources called it the “first official step” of the GOP Senator’s re-election campaign. McCain made it clear not long after losing the presidential election that he intended to seek re-election to the Senate in 2010. This is a great idea. Where do I sign up? McCain is not the face of the Republican party - not because of his age but because he is nothing more than a Democrat with an illegitmate "R" after his name. 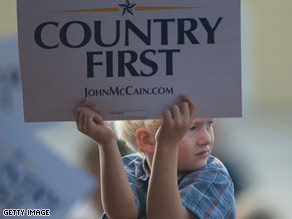 McCain proved in the dismal campaign he ran that he has no concept of 'Republican' principles. Shortly after the election one blogger stated - and I paraphrase - McCain should cross over the aisle one more time, sit down and STAY THERE!!!! Together, we can make government more responsive to today's problems and more answerable to the people. That's why I hope you will become a Charter Member of Country First and support our cause by following this link to make a generous contribution of any amount today. With your help we can work to elect these new leaders to Governorships, Statehouses, the U.S. Senate and U.S. House of Representatives in 2010 and beyond. Once in office they will become fierce advocates for limited government, economic opportunity, personal responsibility and strong national security. I think Senator McCain is plan has good intentions. However, I find that it will be difficult if not impossible for the Republican party to regain control either in the Senate or in the House of Representatives with their current leaders. On the other hand, more moderate, immigration friendly and fiscally conservative people like McCain will be good to the Republican party. McCain blew it when he pandered so heavily to the far right wing of the party. He would have been better served – and would have retained his integrity – if he stayed true to himself. Now he's just a lacky. No principles or convictions. Geez....this old guy still around? Has he figured out the economic thing yet? Are you saying he should not receive his Navy Pension? Was that not earned? I have a better idea. Able body people should get off welfare. There are certain catch phrases and sayings from this past election that I never want to hear again, such as maverick, Joe the Plumber, thanks but no, thanks, and country first is right up there as one of the worst. It's time for John McCain to hang it up. We are in the 21st Century and we need new ideas. This is an old idea he tried in his run for president last year. America has move past what McCain represents. I sure Arizona can do better than McCain and put forth someone fresh. This is good news. John McCain is someone with a record of the strongest commitment to the well-being of the American people, and this is a contination of that commitment. I was proud to join "Country First" and hope many others will, too. Maybe Obama can help him come up with a more catchy slogan. He likes to borrow Obama's lines. I prefer he change his slogan to "Country & Western First"
You have already demonstrated that it will always be "party first" with you during the last election, so which side of your mouth are talking out of this time McLame? How about the slogan, "The Parts of the Country That Are More American First?" LOL McCain never ceases to amaze me. Which country, Mexico, US, Georgia, Iraq, Israel? I can only hope the great people of Arizona will not reelect this guy. Put a fork in him he is over done. "Country First: or my supporters will hang & burn an effigy of you"